My sewing journey from procrastination to completion and other worthy (or not) tidbits of information. She is losing her battle with cancer here on earth, and she is preparing to meet our Lord, while saying goodbye to her best friend (husband Mike) and her wonderful family and friends. Cancer is trying to win and diminish her bright and shining light, but the cancer will never truly win. A light and warmth such as the one Shannon shares with the world, cannot ever truly be diminished. This is the blog she and Mike started to show how they are actually conquering cancer, and have not allowed the cancer to conquer them or their love for each other. http://www.acoupleconquerscancer.com/ There is a clickable link in my "other sites of interest" area at the bottom right side of the blogroll. Reading about Shannon's journey makes me feel ashamed for my whining about work. There are many aggravating changes going on there which none of us have any control over. Many make me very angry, but I have a job (for now) and a wonderful, warm and loving husband. Losing my mother last year just about broke my heart. But her warmth and shining light, just like Shannon's, will never leave. Although, I felt abandoned for awhile, I do know that she would never, ever actually abandon her only child. She is with me always. I looked through my last several posts and noticed a theme, "write about anything that has nothing to do with sewing, so I didn't have to admit to not sewing anything". I still haven't been in my sewing room. At least this time I had a good excuse. 1. I was working full-time and attending school full-tme. How does one do that? Take an accelerated program, with a new class every 5-weeks and you are considered full-time. I barely had time to think and my weight ballooned up another 15-20 lbs. 2. If that wasn't enough, my dear mother was diagnosed with pancreatic cancer around June 15th, and she passed away August 15th. Any Catholics out there would understand the significance of August 15th, at 3:00PM. If you are not Catholic, I won't bore you with the details. Needless to say, it's been a tough few months, and the holidays are even tougher. But, I feel her support and presence with me, and that helps. In 2010 I'm going back to the gym, and I'm going to look up the lady with whom I had planned to take fitting and sewing classes. I'll just sew for the size I am now, and stop planning to sew when I lose more weight. Maybe this attitude will make me actually lose weight. Murphy's Law, you know. Merry Christmas and Happy New Year. I'll be back in 2010. Cowboys are ahead so far................Change that to "They won" !!!! I've been AWOL from my blog for the past couple of weeks as life has simply taken over all my good intentions. Happy 4th everyone!!! Stay safe and enjoy the day! Back to my JCC, which I've hardly started. I did change the pattern for the cherries fabric. I realized the gathered skirt, combined with no longer having a small waist and not wearing a crinoline would just make me look BIG. I've now chosen Vogue 2267, which is a remake of a 1954 design. I will still have the vintage 50's dress, which I feel my cherry fabric was screaming for, without the added weight-gain of the gathered skirt. I also think the little jacket included is darn cute. I also changed the skirt pattern I was using to Simplicity 4091, view F (teal skirt in the middle left). I still plan to use the denim fabric. This skirt I can wear on "Jeans Fridays" as an alternative to crawling into a pair of jeans on a hot summer day. I also purchased 2 knit sewing books last week from Amazon. The first was recommended by Ann (Gorgeous Things blog) Sew U Home Stretch and the second by Gigi (Behind the Seams blog) Designing and Patternmaking for Stretch Fabrics. I am not a fan of Built by Wendy patterns from Simplicity as they are not my style, BUT this is a fantastic book for anyone wanting more information on sewing with knits. The book is intended for beginners and I feel it does a good job helping a beginner get their feet wet in the knit sewing arena. The one caveat is the author zeros in on using a serger. If you don't own a serger you may want to after reading this book. But (again with the "but") you can sew knits easily on your sewing maching using a stretch stitch. I've done it and lived to tell the tale. Just don't ask me about the "fun" I had ripping out every single seam in those pants since I was sewing challenged the day I made them. The book also comes with t-shirt and dress/skirt patterns to get you started, and I think the patterns are rather cute. I will probably try the t-shirt and maybe the dress, with the sleeves (lengthened). This is my new favorite book. 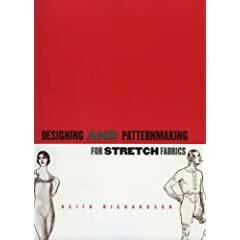 No, I do not intend to create patterns at this time in my life, but if you want invaluable information on stretch fabrics, pattern layout and beyond, grab this book. I learned a lot last night when I started reading. Basically, this is a textbook (and the price reflects that it's a texbook...OUCH!!). The material is well layed out and organized. I think the author, Keith Richardson, is a perfectionist and this is reflected in his writing style and explanations. He is not boring, but factual, and you will learn just about everything you need to know about knits from him. Both of these books are available at http://www.amazon.com/. I know the textbook was in the FIT bookstore when I went to NYC, but I wasn't carrying it around with me through the city. What your taste in chocolate says about you. You are passionate and full of life. You fall in love easily, and you tend to have whirlwind relationships. Your passion sometimes does get the better of you. You have a crazy temper! ETA: I too have scary white legs and believe me today (Monday) you'd never know it after using it twice. I have a love/hate relationship with self-tanners. I need them in order to bare my transparent white legs to the world, but I hate the smell and that it takes so many days to get a decent color. Enter my new favorite product. NAYY!!!!! (not affiliated yada, yada) I bought this new Jergens product a couple of weeks ago and finally decided to try it. I'm shocked and amazed at how quickly it works. The color started to develop in about a 1/2 hour or so. After one application I can bare my legs to the world. 2 applications are better. The lotion goes on evenly (does need to be rubbed in) For once my feet have even color. I'm more than impressed. The bottle is smaller. BUT, once I get to the color I want (2 days vs several with other tanners) I can maintain with the other Jergens or L'Oreal which both are in bigger bottles and are better values. The smell is not great, but it is an improvement over the original Jergens. (which I hate) I just use it at night and by morning the smell is gone, even before my shower. Baking & Candy Making Supplies — Sweet! 1 Seam at a Time - Claire S.
Since 50 is the new 30, then I'm 30. That's my story and I'm sticking to it. ;o) I love life and I strive to find happiness and to be positive in every situation. Sewing, reading, shopping, collecting and blogging are my hobbies. I'm working to remove shopping from the hobby list. Doing this will lesson the need to collect. ;o) God, my husband, my family, and my country are all very important to me. I have strong convictions about God and country for which I will not compromise nor will I apologize. I promise that any visitors to my blog will be treated with respect and dignity, no matter what your personal views or convictions are. I am deeply touched that anyone would want to stop and read my ramblings, and I would like to thank you from the bottom of my heart for taking time from your busy day to read my blog. Take care and God Bless!